Harley Days is a festival run every second year. It is returning to Morzine in 2017. 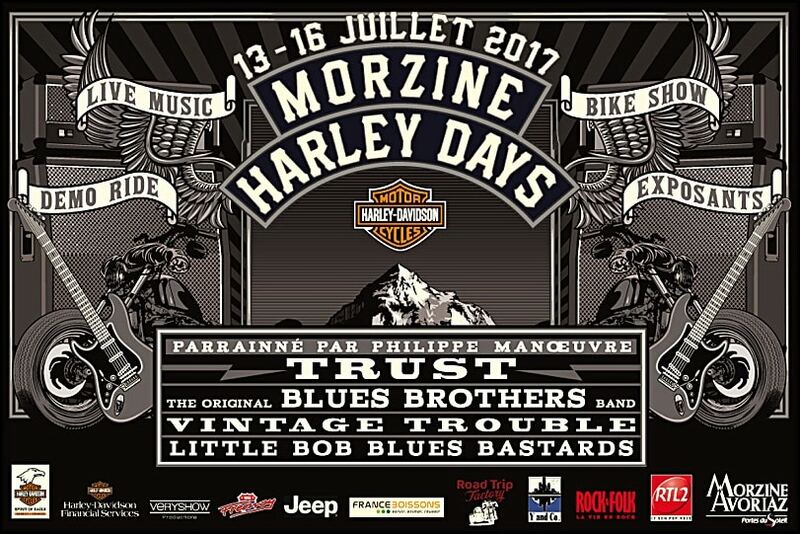 The event is organised by HOG France (Harley Owners Group) and features a mix of live music, bike shows and ride outs for the Harley owners. Previous bands to perform at the prestigious event include Toto and Status Quo. Around 3,000 Harley owners come to town for the event with many non owners also coming to soak up the atmosphere, look at the bikes and enjoy the live music. This year the event runs from the 13th July to the 16th of July, so it will coincide with the Bastille Day celebrations as well, when many of the bars will stay open later than usual or even all night. Bands confirmed to perform this year include Trust, The Original Blues Brothers Band, Vintage Trouble and Little Bob’s Blues Bastards. The main concerts take place in the main square by the Tourist Information Office where a large stage is erected specially for the weekend. The square is always packed out with people watching the acts. Sixty metre screens are put up to allow everyone to have a good view of the concerts. Other attractions over the weekend include a chance for club members to try out the new Harley Davidson range, motorbike displays, stalls lining the Rue Du Bourg and ride out events specially laid on for the club members. Many of the bikes are also put on display along the Rue Du Bourg for fellow fans to admire. The event this year starts at 10 AM on Thursday 13th with a heritage ride with the Morzine Alp Club and free trials throughout the day of the new Harley Davidson range. At 2:30 PM a Chapter Ride begins with the Alpes Spirit Chapter. The event follows a similar format for the next couple of days with a bike show on the Sunday. Trust, the main musical attraction, play from 10:30 PM on Saturday with other acts playing at a similar time on the other days. The concerts continue till midnight. There are also fireworks on the 14th for Bastille Day. Harley Days is well worth visiting as it offers something very different to usual Alpine events, as long as the noise doesn’t put people off! We have a number of self catering chalets in Morzine available and can be flexible around dates.